Have you ever wanted to make a custom food and just knew for sure something was wrong with the Nutrition Facts they provided on the package? For example, I'm 100% sure that there is magnesium in 100% whole wheat bread. Yet the store bought brand does not list it. What to do? Let's use whole wheat bread as the example as we create this custom food. Step 1: When I look on the package of bread, it states that 1 slice is 110 calories for 47 grams. This is the main thing I look at to gauge the estimated nutrient values I will plug into this custom food later on. Create a custom food in your food journal and name the "1 serving" default. 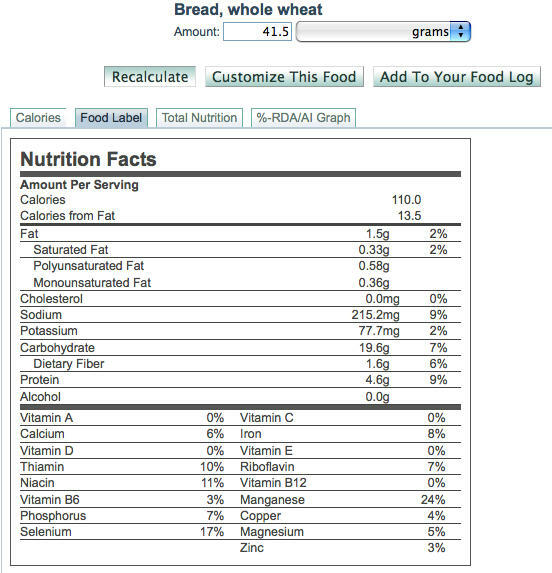 List all of the nutrition information provided to you in the Nutrition Facts about the food. 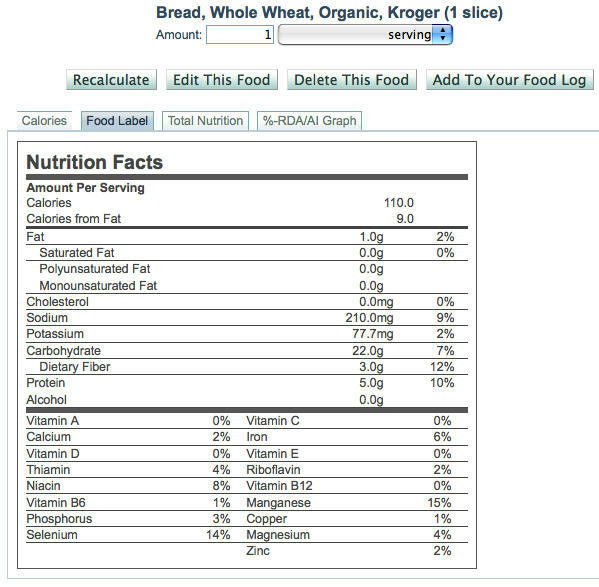 Step 2: In another tab or new browser screen, search for "whole wheat bread" in the FitDay database of foods. When it comes up, it lists the calories of 1 regular slice of bread as 68.9 calories instead of the 110 calories for our custom bread. Change the pulldown menu to read grams instead of slices. Step 3: This is where it gets a bit challenging, but it's really easy. Now plug in a number for FD whole wheat bread and hit "Recalculate". It makes sense to start with "47" since our custom bread is measured in 47 gram slices. Do the calories in the recalculated bread come out to 110 calories (the SAME value as our custom bread, and this is the point here)?? If not, keep playing with the numbers, recalculating, until the grams entered for the FD bread comes out to be close if not equal to the custom bread (110 cals). For this exercise, the number that achieves this is 41.5 grams. Step 4: Now look at the vitamin and minerals data for the recalculated FD bread. Notice it lists Magnesium at 5%? But our store bought bread did not list anything for Mg. So now go back to our custom bread in Step 1 and add all the vitamins and mineral percentages into the custom food that were not provided to you on the package. If you want to be conservative in these values (always a smart choice), you can look at some of the nutrient values given to you in the Nutrition Facts and compare those to the FD data, and you'll see the will never match exactly. For this exercise, it looks as though my store bought bread is less nutritious than the FD bread (using calcium and iron as examples), so I am going to "guesstimate" and reduce all of the percentages that I plug into my final custom food. Thanks again, Vito, very useful "how to".